A seemingly typical lunch with a room full of ladies took on a whole new meaning last Saturday, June 8th at a premier location in one of the city's quiet, suburban neighbourhoods. Maria Kritikos, founder and CEO of Ladies Who Lunch hosted her inaugural event. It was an afternoon of networking with some of Vancouver's most notable and successful female entrepreneurs. 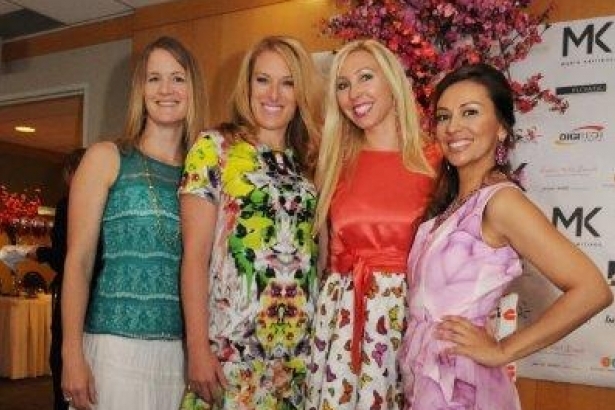 The afternoon featured three inspirational speakers, and exclusive fashion show by international designers Xsenia and Olya and entertainment by international musician Karla Sax. If you were expecting a group of ladies lunching and chatting about frivolous matters you might be surprised about what transpired that afternoon. Something quite the contrary. The crowd of ladies gathered in the room came out with the purpose of connecting and networking both on a business level but also for something more. The positive aura of the women with like-minded ideas, aspirations and goals, converged to create a powerful energy that vibrated through the room. They also came for a sprinkle of inspiration and for a healthy dose of empowerment. It is that something more we seek sometimes that helps to fuel our dreams and propel us into action. Sometimes we seek it in the uplifting and motivating environment of a group to help our seed grow. Sometimes we find it through a supportive friend, spouse or parent. But ultimately, we must dig deep within and take action to achieve our personal dreams and goals. What made this event unique was the element of glamour, fun and femininity placed into the mix. Yes, powerful and glitzy and business can operate extraodinarily in the same sentence, thank you very much. With this attitude, the ladies arrived, checked-in, mingled and posed for photos all while looking fabulous and feeling fearless. The first lady of the afternoon, Zain Saraswati Jamal, a certified Holistic Nutritionist, Yoga Teacher and Coach introduced our host for the afternoon and centered us with a grounding exercise. She instructed us to uncross our legs (how unladylike! ), place our feet firmly on the ground and remove our shoes if we wished. We then placed one hand on our core stomach area and one hand on our heart to connect to these corresponding chakras. We then closed our eyes (optional). The next step was to be still, relax and breathe. In through the nose - a deep powerful breath. Exhale consciously through the nose again. Feel our life force through our breath, stillness and centeredness. This short but powerful grounding exercise brought awareness to the importance of our health, centre core and to take good care of ourselves - mind, body, and soul. Some other salient takeaways: Don't get to the end and wish you had. When someone asks you what your dream is, answer it. Or, at the very least, think hard about it. What would you do if you knew you could not fail? Great question. Don't be afraid to go forth fearlessly and passionately. Many women in the room were living their dream already and sought to further promote their business, expand their network and make new connections. "Ladies in the Spotlight" followed with Maria inviting any of the ladies in the room to stand, introduce themselves, their businesses and share any goals for the future or connections they would like to make. This created a feeling of camaraderie and support and served to familiarize the ladies with one another.